Lot 674. Julia Domna. Augusta, A.D. 193-217. AR denarius (18 mm, 2.58 g, 11 h). "Emesa" (Antioch), under Septimius Severus, A.D. 193-196. 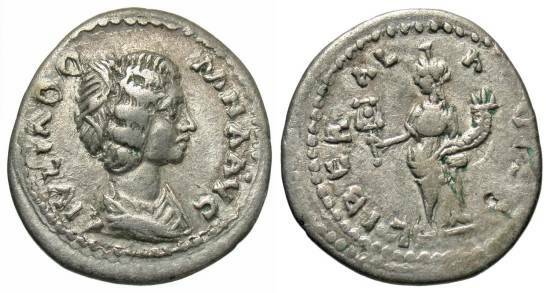 IVLIA DOMNA AVG, draped bust of Julia Domna right / LIBERAL AVG, Liberalitas standing left, holding abacus and cornucopia. RIC 627; BMC W419; RSC 103. Very fine.